Since Colour Correcting is all the rage right now, I wanted to share some tips and tricksÂ to help make sense of it all! Just like contouring, color correcting is not something new. Industry professionals have been using this techniques for decades. The whole point of makeup is to make your skin look flawless, help you feel gorgeous and to amplify your best features. Without colour correcting Â your makeup can look ashy, uneven, and can exaggerate your blemishes. The concept behind colour correcting is colour theory. You can try to neutralize your problem areas by using correctors that are the opposite pigment on the colour wheel. Here is a simple chart that can help you understand colour theory better. Remember, just like everything else in makeup, there is no ‘one size fits all’ approach. There are several ways to colour correct redness based on the intensity of it and the skin undertone. For example you can have redness around a blemish, all over face redness and rosacea. All over face redness with fair skin, usually has a pink undertone. The best solution for this is a green colour based primer. For rosacea you can use either a green concealer in your problem spots or a green based primer.Â You can go over the primer or concealer with either your flesh tone concealer or your skin match foundation. 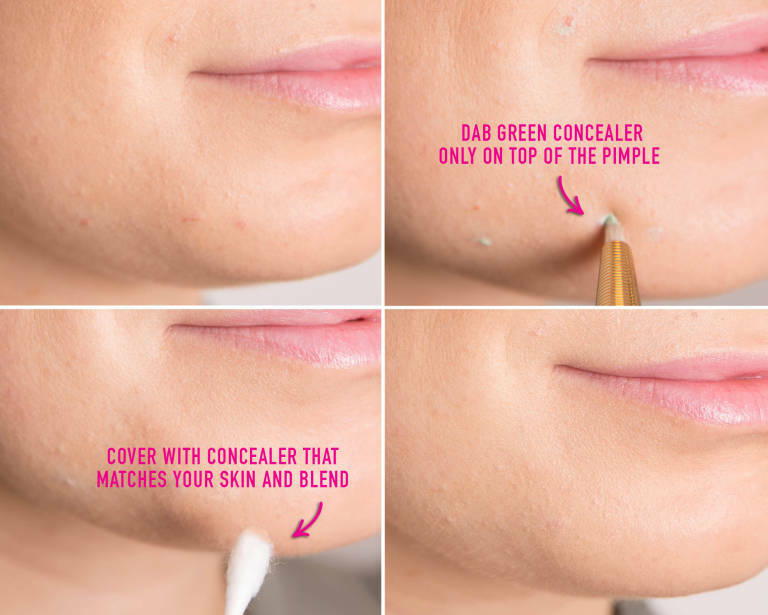 For a blemishes you can use a green concealer with a concealer brush. It is important to not rub your concealer but toÂ lightly ‘dap’ it into the skin. This will help the product to be concentrated on one spot and not get blended inÂ with the rest of your makeup. This is probably the type of colour correcting most people get wrong. A lot of people would put the same concealer they use under the eyes on their blemish scars, which leads to highlighting your scars instead of covering them up. If you just put your skin colour concealer on it or a foundation on top without colour correcting, you might still be able to see the scar. On Light to Medium skin tones, you should use a neutral concealer that is 1-2 tones darker than your skin. Followed by your skin tone concealer or foundation. For Medium to Dark skin, you may use a neutral tone concealer that is 1-2 shades darker, or you can also use an orange based concealer that eliminates the blue/purples on the scar followed up your skin tone concealer.Â Remember to dab, not rub! Colour correcting is a process. I usually like to colour correct after my primer and before I do my foundation and contour. This helps me identify if an area needs more concealing/highlighting and it also adds another layer to neutralizes the colour concealers. I Â love using a beauty blender to blend inÂ the concealer, since you are pressing the makeup into the skin instead of moving it around with a brush. If you don’t have a beauty blender the next best thing is your finger! I have Med-Tan skin, and here is how I would colour correct my entire face depending on the issue. Check out my Instagram (MakeupBySehar)Â for a complete list of products used. Hope this post was helpful! What are some of your tips and tricks? Such a great post!! Great tips too!! Love it! Thank you Sabrina! And for freckles, I would always make sure to wear sun screen. The best way would be to put on primer, use a concealer (same shade as your skin or 1 tone lighter depending on the area of the freckles) then foundation and set it all with translucent powder so your makeup doesn’t move. I would use a wet beauty blender to apply these products so you are pushing it into your skin for a better coverage. For concealer my favorite one from the drug store is Maybelline age rewind, high end would be Nars or Make Up for Ever. For foundation my favorite full coverage one is L’Oreal Infallible. High end would be Make Up For Ever HD foundation or the Kat Von D. If your skin is dry you can mix these foundations with essential oil for a satin finish. For translucent powder Elf has a good one and high end would be Laura Mercier or Make Up For Ever. For additional hydration to your skin you can finish your makeup off with a setting spray, L’Oreal has a good one and Urban Decay.